Hello everyone are you ready for the big jolly fella in red? No I'm not either but I'm still getting excited even though I have 101 things to do lol. Before I tell you what I've made I just want to point out some new Roxstamps dies I've used, I've used two new ones and one of them is in the picture above. They are like Baubles I think with stars in them, Stars Xmas Tree Ornaments they are called and I've added them as a tag kinda thing.....I love them!! There is a gift at the end of the post! and also a link to the tutorial on how to make these boxes. I thought I would make my 2 grandchildren a little something for Christmas Eve while they are sitting with mum anddad after their tea watching Christmas movies. They love things I make, my granddaughter is always pinching the latest card I've made and she sits them all on her window sill in her bedroom with pride.........makes me sooooo happy. I had to use these Santa Heads as they are just perfect, I coloured them with Copics and added Flowersoft to his beard to make it fluffy. 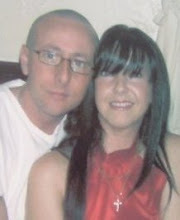 I coloured them both with red hats as little children say Santa only comes in red lol. I also added a spring underneath the head so it wobbles every time it's touched, the kids will love that part lol. I have made little boxes to hold a bar of chocolate....the chocolate in there is not what they are getting.....if I get it now I will end up eating it lol. There is also the other new Roxstamps die which is the Reindeer Xmas Tree Ornament hanging on the side. I cut out two. One in co-ordinating paper from Vintage Frost and the other in white card stock and slightly off-set them. The hearts in the centre have magnets underneath to keep the box closed. The hearts were made with a die from a DooHickey Collection. On the back of both boxes I added a sentiment from the latest Magnolia collection. The tag die is also Magnolia. In the latest Magnolia Doohickey Collection Volume 17 (which is still available here if you want to buy it). They are excellent value for money, not only do you get a LOT of dies that you can use in various ways, you also get a Magazine with tutorials in it and inspiration. Now if I take inspiration from someone I also say who, it's just the right thing to do. 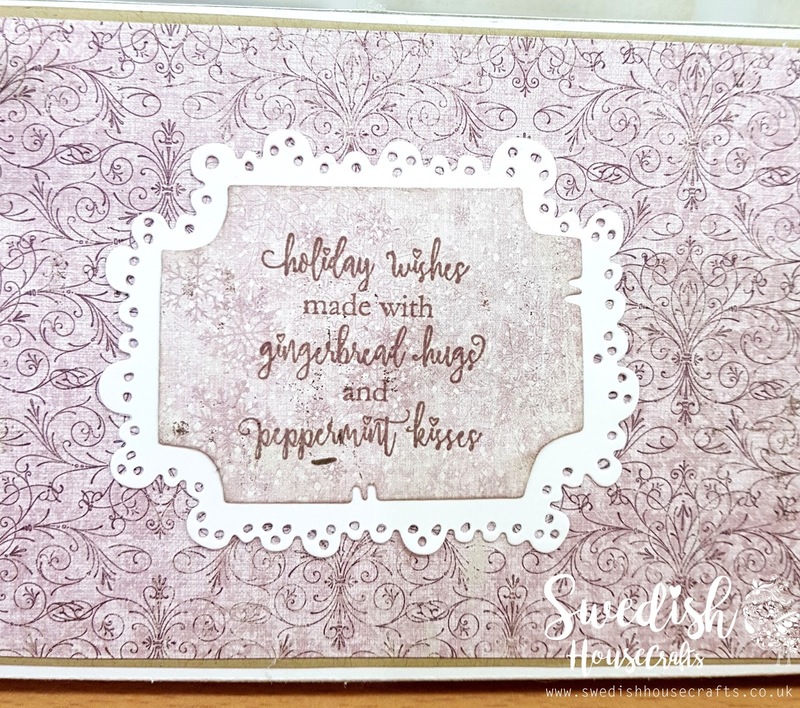 My inspiration came from the magazine, the super talented Yulis (I so want to colour like her when I grow up) I did a tutorial on how to do this scene effect like I've done on the chocolate boxes. After I made them I thought well not everyone will have the die used on these chocolate boxes. 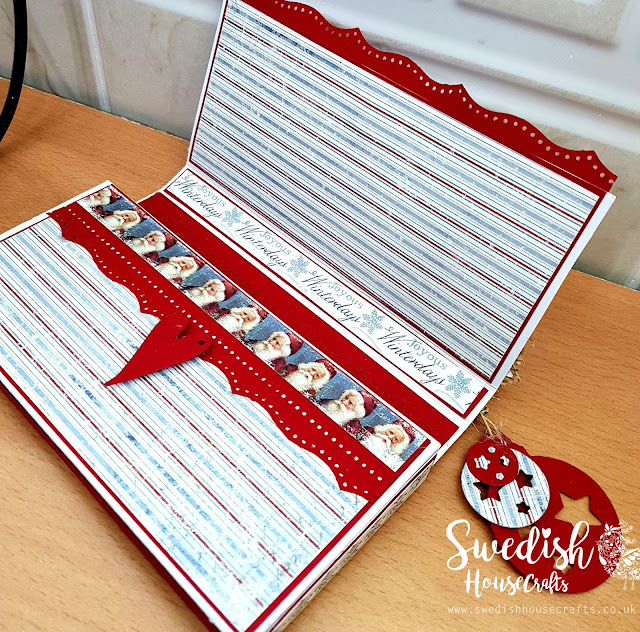 However I then remembered I had brought a die from Swedish House Crafts about a month ago and still not used it.........yes I'm bowing my head in shame! So here is another way you can achieve this effect, I made a matching Christmas card for my granddaughter. The photo above shows what you need. Using one of your pieces of white cardstock cut waves into it to act like a snow. I cut two like this, you want one thinner than the other. The deeper one goes onto your paper so must be the same width as your paper/card. Glue or tape down down the bottom edge to the paper. Leave the top wavy edge free of glue. 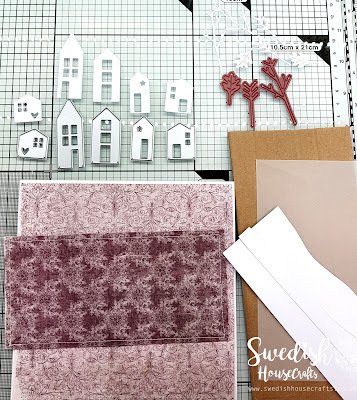 For the houses I have used Gummiapan House dies, they are awesome, you get 5 little houses that are all individual so you can use all 5 or just use 3....depending on the scene you are creating and the size you are doing. 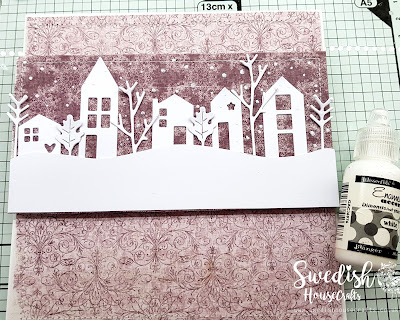 Once you have cut your houses out arrange them as you want them, sliding the bottom of each house just under the wavy card stock you glued down first. This is why we keep the top edge free from glue, its nicer if you don't see the bottom edges of the houses. Next take your leaves if that is what you are using and arrange them in between the houses, cut some down to make them look different heights. If you have tiny tree dies then use them but leaf dies will do the job just as well I think. Sliding the bottom of the leaf just under the top edge of the card stock. Once you are happy with the layout glue them all into position. I then took some Enamel Accents which I've had forever and placed dots all over to act like snow is falling, this is optional. You could also use a pearl pen or even a white gel pen. Using the thinner wavy card stock glue that onto the vellum, so that the card stock is facing up. Once this has dried and your snow drops on the paper have dried attach your vellum to the scene. I have cut my vellum to the exact size of the centre panel that I have made my scene on. To glue it down I used tiny drops of glue from my glue gun, I did the top two corners first just using a tiny bit and then I did the bottom. Make sure the card stock you have glued on is on the top facing up. The bottom is easier as it has the card stock on the other side and this will hide any glue marks. 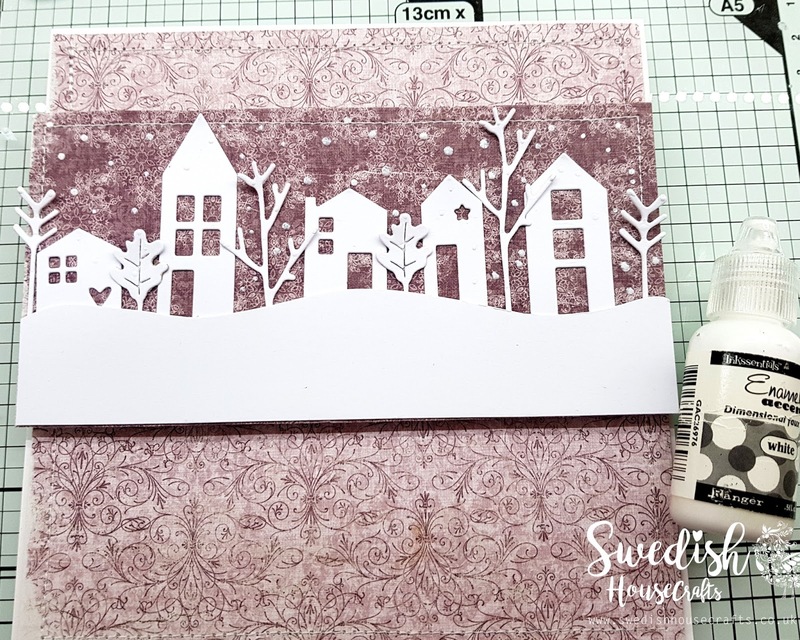 To help hide glue in the top two corners I then attached pearl stars which go with the scene anyway, you could even use star die cuts. I have attached a string of pearls as I did on the chocolate boxes but this is optional. 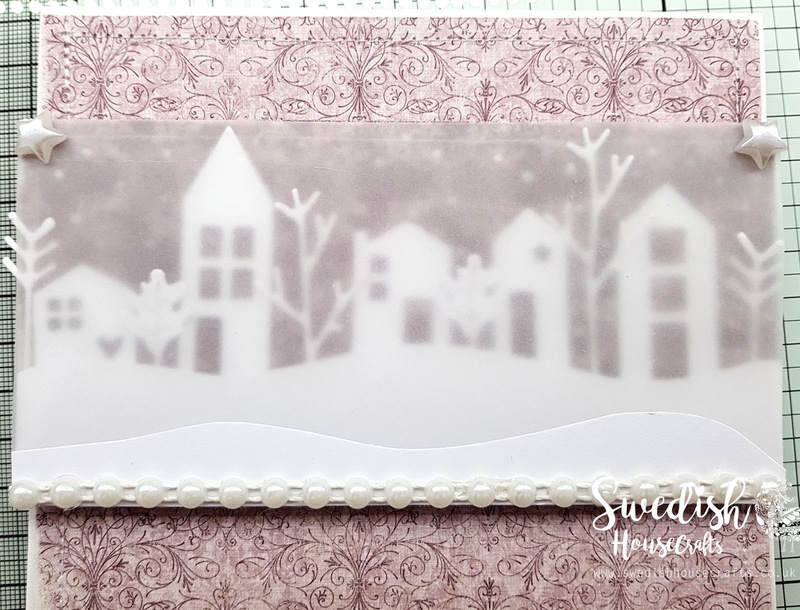 I also added more white dots on top of the vellum once it was in place as it shows up more on the vellum....so the snowfall looks as though some is close and some is in the distance. Here it is all finished. If I'm being totally honest I do prefer the look from the Gummiapan House dies as they stand out more and I love how you can arrange them yourself, its not fixed. I am really happy with these and I'm usually very VERY critical of my own work (I think a lot of us are lol). 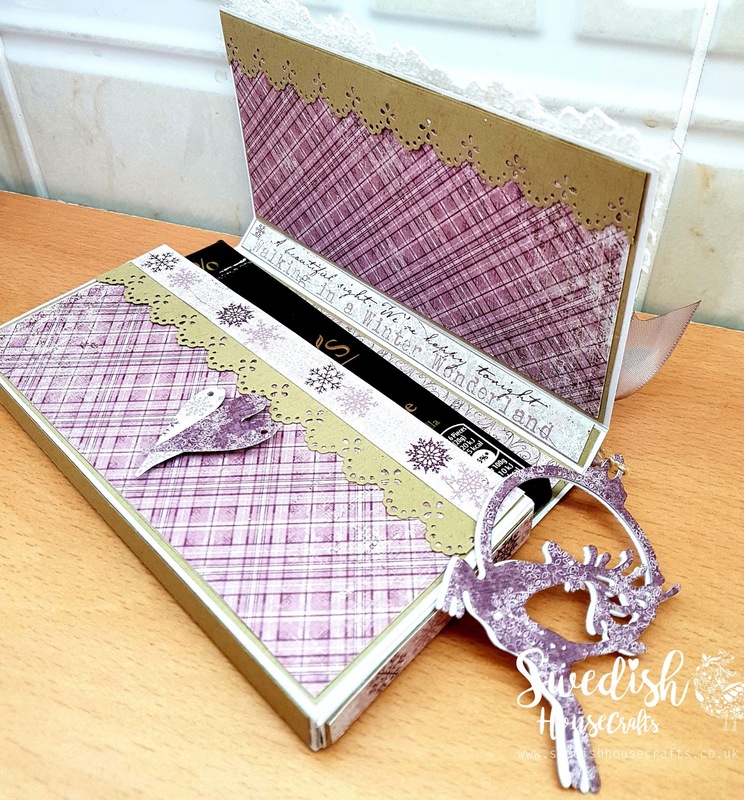 I used one of the super new Tildas from the Autumn Stamp Club but these are now available in Suha's store. 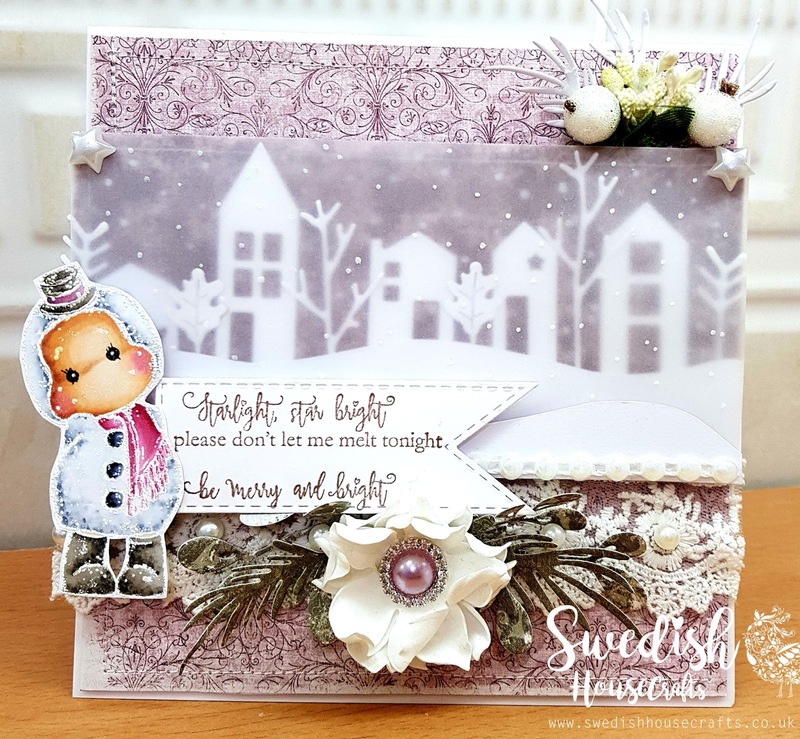 I used "Frozen Tilda" and stamped her with versamark watermark ink and then heat embossed with white embossing powder. I then coloured her in with Copics.....I'm still really rusty with these lol. I also used a sentiment from the same latest Magnolia collection and then cut it out using a Gummiapan banner die. The poinsettia I made myself using white foamiran and I added leaves using Magnolia dies. Lace is from my stash. The berries and pomegranate apples are from Swedish House Crafts. 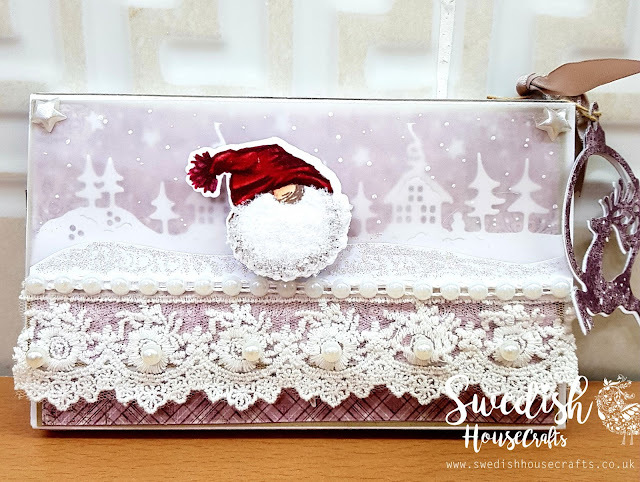 Now if you would like to make one of these chocolate boxes then you will find a tutorial over on my blog here which I did earlier in the year. I usually add a pocket to the inside but I've kept the inside simple as they are for a 4 year old boy and a nearly 6 year old girl. The code you need to get 5% off is O5CDMF7Y7828 it is valid until the end of December. Thank you for staying to the end as this one was a long post lol. Hope you all have a good weekend, take care.